You want something to eat and it’s before or after a big game or concert at the PNC Arena or Carter-Finley Stadium? Here are some choices of where to eat if you’re in the area and want to stay pretty local. Backyard Bistro – Huge, comfortable for sports fans and has lots of bar food and appetizers. Some of the food is pretty good, some is not. It’s the closest to the arena so can get extremely crowded. Buffalo Brothers is a decent chain with indoor and outdoor seating near Rex Hospital featuring pizza and wings. Spirits Pub & Grub is in nearby Cary but has better food than the bars that are closer. Rudino’s has pretty bad food, including the pizza. The grinders and wings are tolerable, and they have drink specials. Edwards Mill Bar & Grill also has substandard food but has drink specials. 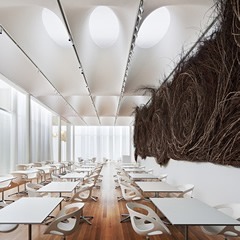 Iris restaurant at the museum of art is open friday nights till 10pm (last seating at 8:30). Admission to the museum is free, so you can wander around and look at the art if you’d like. Maximillian’s in Cary is a little drive down NC 54, and you can make reservations online. 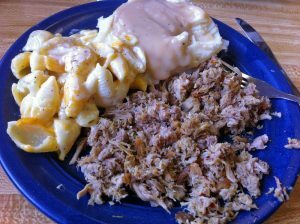 Ole Time Barbecue, by the railroad tracks, has simple homestyle NC BBQ, hush puppies, macaroni and cheese and the like. You can even order online! Neomonde has excellent Mediterranean food with a huge deli case of fresh, healthy sides that you can choose from. Stand in line to order and then they will bring the food to your table. 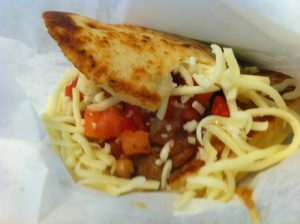 Guasaca arepas is like a Chipotle but serves arepas (like a cornmeal patty taco), salad bowls and rice bowls. Top your dish with plantains and some guasaca (avocado pico). If you have time to explore further than a few miles around the PNC Arena, make sure to check out my Raleigh, Cary, and Durham posts for the best eats in town.